More than 30 years ago, Amtrak paid for my train fare and sleeper in return for a travel story. This week, the rail passenger service rolls out a promotion, which will select 24 writers for an “Amtrak Residency.” A December New Yorker story about writing on trains created a social media buzz which Amtrak has latched onto. A requirement that participating writers surrender publishing rights and allow their musings to be used in a future marketing or advertising campaign has garnered additional publicity for Amtrak. I was mildly interested in the controversy but what captured my attention was that the last leg of my big move west in 1981 was – thank you very much – courtesy of Amtrak. I was leaving behind Vermont, New York, and other points east for California. 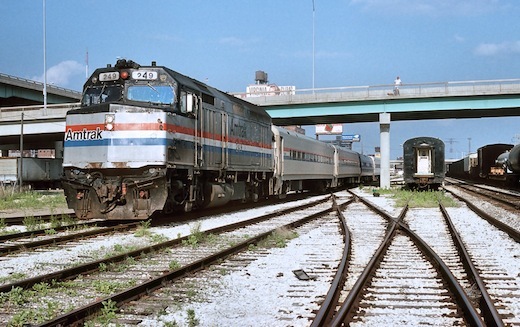 At the time, I had been covering the politics of passenger rail, had many contacts at Amtrak and took up the fight when President Reagan’s first budget cut its federal funding. So before leaving, I arranged to do a travel piece for my former employer, the Vanguard Press, an alternative weekly published out of Burlington. For three years, I had been writing news, politics and culture from the nation’s tiniest capital city, Montpelier (pop: 8,000). I was in D.C. than South Florida before boarding the Sunset Limited in New Orleans for my free-bee two-day trip to L.A. Though I didn’t know it then, this train was famous for, among other things, helping African Americans leave Louisiana and Texas to work in the war industries in Los Angeles during World War II. Not only were we trying to spot an endangered species [I wrote], we were riding one. The Sunset Limited and dozens of other passenger trains will vanish into history with the steamboat and the stagecoach if the Reagan Administration gets its way. The President’s warriors on government spending have opened fire on Amtrak… … etc., etc. The rest of the piece touched on economics, transportation policy, energy, political posturing, and finished with anecdotes about bad plumbing in one of the train’s cars and the kitchen running out of butter. Looking back, I’m surprised the article didn’t focus more on the the enormous change I had made in my life, leaving cozy rural Vermont for SoCal’s anonymity and sprawl. That’s what I was thinking early in the morning, 40 miles east of Los Angeles, looking through the window at the back side of what I would learn to call the Inland Empire. Soon we’d be snaking through the freight yards and pulling into the Amtrak platform at L.A.’s Union Station. It was a dramatic opening scene – almost cinematic – filled with promise. I’d arrived well rested and in style, ready to take on the town. This article was originally posted at Lou Siegel’s blog LaborLou.com and republished with the author’s permission.